A quick rundown of some top water stories, which remind us that while we can impact nature, we’re really not in charge. I realize that there is a weird-seeming contradiction in saying that we can bring great change to nature, but that we’re still at its mercy. But when we say “great change”, we don’t mean permanent. The earth will eventually repair itself, and time will smooth over our cataclysms. We just won’t be here. But you want the real image? Imagine a 7-yr-old jamming a hatpin into his mother’s ankle. He can do that, and cause great damage, but really, the storm will redound upon him. So let’s start this week’s “hey, who cares about clean water?” news with Wisconsin. Look, this is just the way the market works, ok? 1967 painting of the Peshtigo Fire by Luanne Harff-Burchinal, from the Peshtigo fire museum. In which Scott Walker gets some pushback for wanting the people of his state to fry up. More in-depth investigative reporting from The Guardian uncovers papers thought destroyed that tie Walker to a nexus of anti-Democratic, but possibly tragically legal, corporate greed. 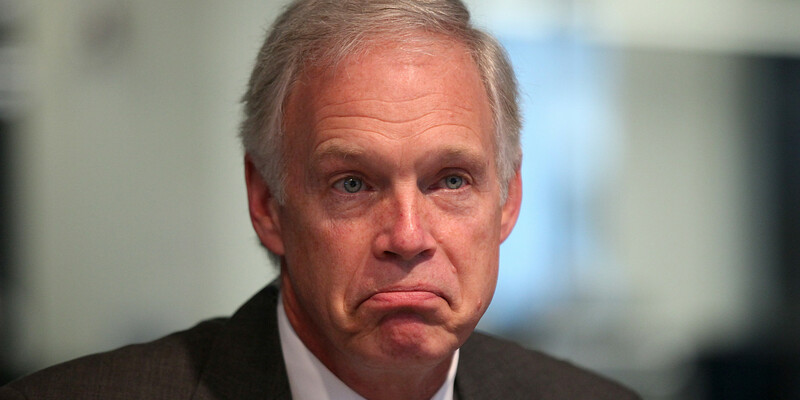 We haven’t talked much on the blog about Ron Johnson, Senator of Wisconsin. Wisconsin being literally near me, and dear to my heart, we’ve spent a lot of time on the destructive reign of Scott Walker, the intellectual horrorshow of Paul Ryan, and even some on the quisling nebbishness of Reince Priebus. They are sort of the Big 3 in the new era of Wisconsin politics: ruthless hyper-capitalists with zero respect for the state’s progressive traditions, who think any hint of community is communism. But we’ve ignored the Senator, who defeated the great Russ Feingold in the catastrophe of 2010. That’s because he’s…well, he’s pretty dumb. He’s one of those “I’m good at business so let me screw over the poor” kind of guys. He was perfect for Wisconsin in 2010. Honestly, the most remarkable thing about him is that he’s the head of the Homeland Security Committee, which could be shorthand for just what a stupid and unserious party the Republicans really are. Anyway, he smuckered together some words today about global warming, and you’ll never guess: it’s a hoax. I’ve been lovingly making fun of this sign for years- really, you have all three?- but I don’t know if I ever noticed the “open for business”. Is that new. 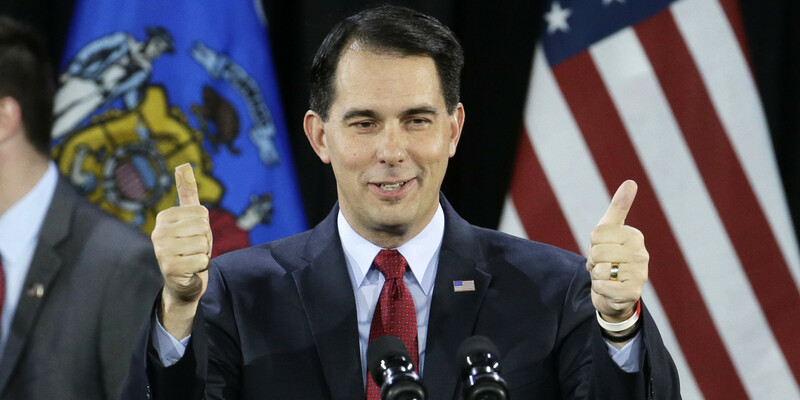 Here at Shooting Irrelevance, we’ve spent some time talking about what Scott Walker is doing to Wisconsin, because being a Chicago kid, we’ve spent a lot of time in Wisconsin. I love the state: love the people, love the food, love the drinking culture. I realized once it is the unpretentious south. You can’t see them writing a Huckabee-style book called God and Hot Ham Rolls. It’s a beautiful place where nature plays a deep role. Underneath all that, or perhaps because of the cold winters and the need for community, is a fierce tradition of progressive populism. Wisconsin is our great labor state, or at least it was. That’s one of the tragedies of Scott Walker. He came in with the idea to ruin Wisconsin, to ruin the idea of Wisconsin. To literally change the Wisconsin Idea. If you want to know everything base and venal about Scott Walker and the Wisconsin Republicans, remember that the literally wanted to edit the Wisconsin Idea to remove anything about the human spirit, and put in language about the state’s workforce needs. The mission of the system is to develop human resources to meet the state’sworkforce needs, to discover and disseminate knowledge, to extendknowledge and its application beyond the boundaries of its campuses and toserve and stimulate society by developing develop in students heightened intellectual, cultural, and humane sensitivities, scientific, professional and technological expertise, and a sense of purpose. Inherent in this broad mission are methods of instruction, research, extended training and public service designed to educate people and improve the human condition. Basic to every purpose of the system is the search for truth. It’s this baseness, this venality, this reduction of the unaligned poor to gristle in a mill that is the heart of the modern conservative movement. Trump’s white nationalism is a part of it, of course, but when he is (hopefully soon) swept from the stage this will remain. It’s the main economic message. Most humans exist to make others rich. Money is the only power. It’s true materialism. Walker confirmed this yesterday, when talking about school funding, and how the rich school should be able to hoard all the good teachers. Walker said school districts can set pay based on performance and hire based on merit. When asked whether he thought such incentive-driven salary programs would be a hindrance to allowing school districts to keep quality teachers, Walker compared teaching to being a player in the NFL. And, you know, some schools are the Pack or the Pats, and some are the Rams. That’s just the way the market works. You have winners and Lions. Walker was a joke during the Presidential campaign, but he didn’t disappear. He went back to his true love: ruining Wisconsin. Walkerism isn’t going away. White nationalism and “othering” will alwas be a driving force in the GOP, as presently constituted, but its fires might not always burn so bright. When that fire is embers this mentality, the desire to turn everything into commodity, including and especially people, will remain.